Timeless hymns that have survived for centuries somehow grow more valuable from generation to generation. 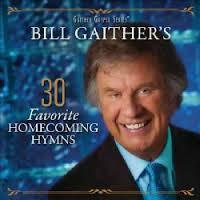 Now, 30 of these time-proven favourites are brought together in this stellar collection of Bill Gaither's favourite hymn performances from Gaither Homecoming concerts and video recordings. This two CD hymn collection features songs of joy, messages of eternal hope, and truths that never fade with time. Messages and melodies that have transcended generations, sung by gospel music's best-loved voices, create a keepsake to treasure for years and pass down to the next generation of listeners.